Register an application in Azure. Embed a Power BI report into an application. A Power BI Pro account (a master account that is a username and password to sign in to your Power BI Pro account), or a service principal (app-only token). You need to have your own Azure Active Directory tenant setup. 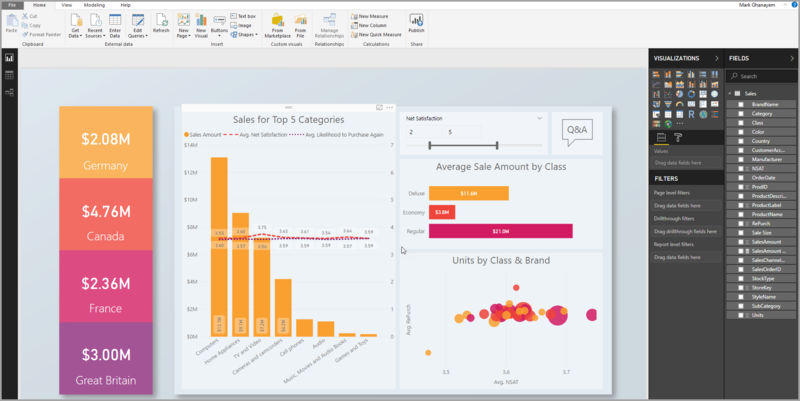 If you're not signed up for Power BI Pro, sign up for a free trial before you begin. Before you start embedding reports, dashboard, or tiles into your application, you need to make sure your environment allows for embedding with Power BI. You can go through the Embedding setup tool, so you can quickly get started and download a sample application that helps you walk through creating an environment and embedding a report. However, if you choose to set up the environment manually, you can continue below. Register your application with Azure Active Directory to allow your application access to the Power BI REST APIs. Registering your application allows you to establish an identity for your application and specify permissions to Power BI REST resources. Depending if you want to use a master account or service principal, determines how to get started registering an application. Depending on which method you take, affects which type of application you register in Azure. If you proceed using a master account, then proceed with registering a Native app. You use a Native app because you're working with a non-interactive login. However, if you proceed using the service principal, you need to proceed with registering a server-side web application app. You register a server-side web application to create an application secret. If you're embedding reports, dashboards, or tiles for your customers, then you have to place your content within an app workspace. There are different types of workspaces that you can set up: the traditional workspaces or the new workspaces. If you're using a master account, then it doesn't matter which type of workspaces you use. However, if you use service principal to sign into your application, then you're required to you use the new workspaces. In either scenario, both the master account or service principal must be an admin of the app workspaces involved with your application. You can create your reports and datasets using Power BI Desktop and then publish those reports to an app workspace. There are two ways to accomplish this task: As an end user, you can publish reports to a traditional app workspace with a master account (Power BI Pro license). If you're using service principal, you can publish reports to the new workspaces using the Power BI REST APIs. The below steps walk through how to publish your PBIX report to your Power BI workspace. Download the sample Blog Demo from GitHub. 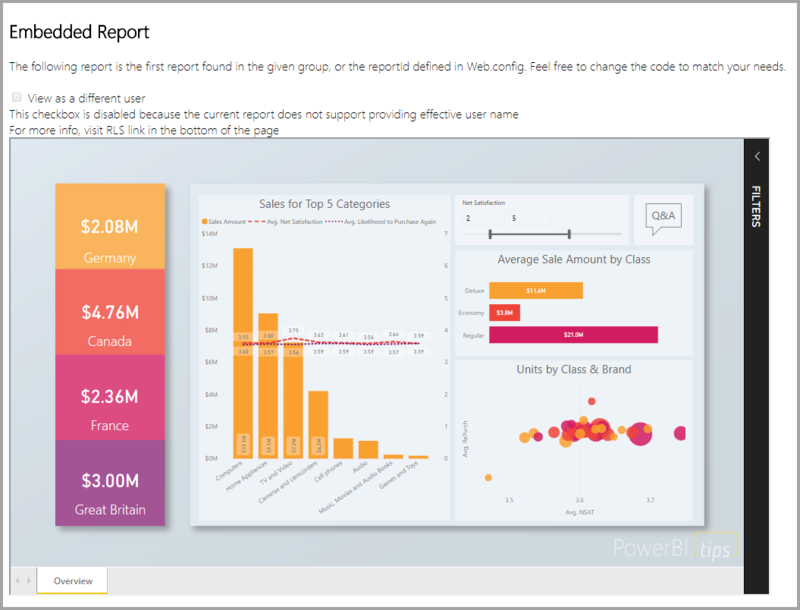 Open sample PBIX report in Power BI Desktop. Publish to app workspaces. This process differs depending on whether you're using a master account (Power Pro license), or service principal. If you're using a master account, then you can publish your report through Power BI Desktop. Now if you're using service principal, you must use the Power BI REST APIs. This sample is deliberately kept simple for demonstration purposes. It's up to the you or your developers to protect the application secret or the master account credentials. Follow the steps below to start embedding your content using the sample application. Download Visual Studio (version 2013 or later). Make sure to download the latest NuGet package. Download the App Owns Data sample from GitHub to get started. Open the Web.config file in the sample application. There are fields you need to fill in to run the application. You can choose MasterUser or ServicePrincipal for the AuthenticationType. Depending on which type of authentication method you choose there are different fields to complete. The default AuthenticationType in this sample is MasterUser. This attribute is needed for both AuthenticationTypes (master account and service principal). Fill in the applicationId information with the Application ID from Azure. The applicationId is used by the application to identify itself to the users from which you're requesting permissions. In the left-hand navigation pane, select All Services, and select App Registrations. Select the application that needs the applicationId. There's an Application ID that is listed as a GUID. Use this Application ID as the applicationId for the application. Fill in the workspaceId information with the app workspace (group) GUID from Power BI. You can get this information either from the URL when signed into the Power BI service or using Powershell. Get-PowerBIworkspace -name "App Owns Embed Test"
Fill in the reportId information with the report GUID from Power BI. You can get this information either from the URL when signed into the Power BI service or using Powershell. These attributes are needed only for the master account AuthenticationType. If you're using service principal to authenticate, then you don't need to fill in the username or password attributes. Fill in the pbiUsername with the Power BI master account. Fill in the pbiPassword with the password for the Power BI master account. This attribute is needed only for the service principal AuthenticationType. 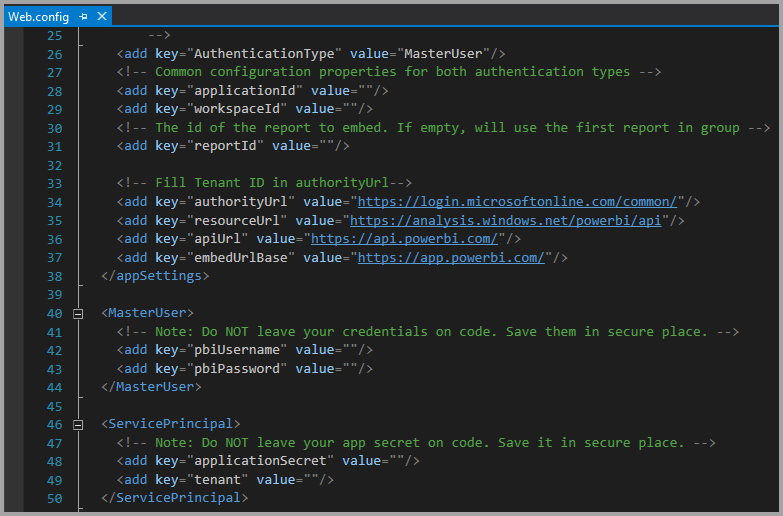 Fill in the ApplicationSecret information from the Keys section of your App registrations section in Azure. This attribute works when using service principal. In the left-hand navigation pane, select All services and then select App registrations. Select the application that needs to use the ApplicationSecret. Select Certificates and secrets under Manage. Enter a name in the Description box and select a duration. Then select Save to get the Value for your application. When you close the Keys pane after saving the key value, the value field shows only as hidden. At that point, you aren't able to retrieve the key value. If you lose the key value, create a new one in the Azure portal. Fill in the tenant information with your azure tenant ID. You can get this information from the Azure AD admin center when signed into the Power BI service or by using Powershell. Select Run in Visual Studio. Then select Embed Report. Depending on which content you choose to test with - reports, dashboards or tiles - then select that option in the application. Now you can view the report in the sample application. Even though the steps to embed your content are done with the Power BI REST APIs, the example codes described in this article are made with the .NET SDK. Embedding for your customers within your application requires you to get an access token for your master account or service principal from Azure AD. You're required to get an Azure AD access token for your Power BI application before you make calls to the Power BI REST APIs. To create the Power BI Client with your access token, you want to create your Power BI client object, which allows you to interact with the Power BI REST APIs. You create the Power BI client object by wrapping the AccessToken with a Microsoft.Rest.TokenCredentials object. // Create a Power BI Client object. it's used to call Power BI APIs. // Your code to embed items. You can use the Power BI client object to retrieve a reference to the item you want to embed. Here is a code sample of how to retrieve the first report from a given workspace. 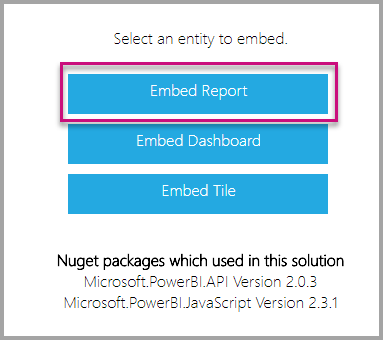 A sample of getting a content item whether it's a report, dashboard, or tile that you want to embed is available within the Services\EmbedService.cs file in the sample application. // You need to provide the workspaceId where the dashboard resides. // Get the first report in the group. A sample of creating an embed token for a report, dashboard, or tile want to embed is available within the Services\EmbedService.cs file in the sample application. A class is created for EmbedConfig and TileEmbedConfig. A sample is available within the Models\EmbedConfig.cs file and the Models\TileEmbedConfig.cs file. Here is a sample that uses an EmbedConfig model and a TileEmbedConfig model along with views for a report. A sample of adding a view for a report, dashboard, or tile is available within the Views\Home\EmbedReport.cshtml, Views\Home\EmbedDashboard.cshtml, or Views\Home\Embedtile.cshtml files in the sample application. // Get models. models contains enums that can be used. // Embed configuration used to describe what and how to embed. // This object is used when calling powerbi.embed. // This also includes settings and options such as filters. // Embed the report and display it within the div container. Now that you've completed developing your application, it's time to back your app workspace with a dedicated capacity. Dedicated capacity is required to move to production. By creating a dedicated capacity, you can take advantage of having a dedicated resource for your customer. You can purchase a dedicated capacity within the Microsoft Azure portal. For details on how to create a Power BI Embedded capacity, see Create Power BI Embedded capacity in the Azure portal. Use the table below to determine which Power BI Embedded capacity best fits your needs. With A SKUs, you can't access Power BI content with a FREE Power BI license. Using embed tokens with PRO licenses are intended for development testing, so the number of embed tokens a Power BI master account or service principal can generate is limited. A dedicated capacity requires embedding in a production environment. There's no limit on how many embed tokens you can generate with a dedicated capacity. Go to Available Features to check the usage value that indicates the current embedded usage in percentage. The usage amount is based per master account. For more information, see Embedded analytics capacity planning whitepaper. Once you create a dedicated capacity, you can assign your app workspace to that dedicated capacity. To assign a dedicated capacity to a workspace using service principal, use the Power BI REST API. When you are using the Power BI REST APIs, make sure to use the service principal object ID. Follow the steps below to assign a dedicated capacity to a workspace using a master account. 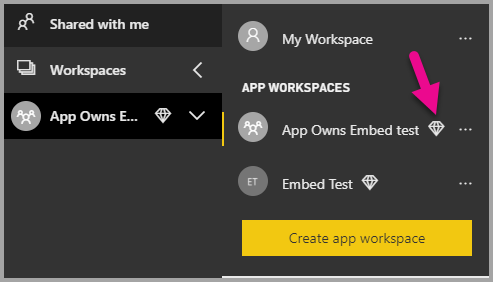 Within the Power BI service, expand workspaces and select the ellipsis for the workspace you're using for embedding your content. Then select Edit workspaces. Expand Advanced, then enable Dedicated capacity, then select the dedicated capacity you created. Then select Save. After you select Save, you should see a diamond next to the app workspace name. In this tutorial, you've learned how to embed Power BI content into an application for your customers. You can also try to embed Power BI content for your organization.